My right hand man has gone off on maternity leave, and I wasn’t happy about it. So I promised to bake her a cake for her farewell. And it would be a special one. A baking triumphant treat. After all, I wanted her to know exactly what she was missing as she chose to leave the workforce to have yet another adorable looking baby. My cooking. You see, apparently I’m a feeder. I like to cook, and I love to feed hungry people. SO has been saying for months that I need to stop, as I’m taking the food out of his mouth to feed the workplace. Not true at all, one simply cannot eat all the food I cook. So I share it round. Knowing all weekend that I needed to bake this Cake Spectacular, I kept forgetting, and cooked soup instead (post to come). Come Monday night I walk in the door at 10pm after dinner out at Chong Co in Woden, and remembered that I needed to bake. Frantically I searched the pantry for the items I needed to bake a fancy almond lemon cake with dulce le something or other. I found a small amount of brown sugar, self raising flour, 2 eggs and 2 lemons. Who does the shopping round here? I Googled “2 eggs 2 lemons” and found this recipe which I yet again, had to adjust to fit my meagre rations. You’ll also notice that the colour of my cake doesn’t particularly resemble that of the lovely light lemony loaf in the linked blog. This is due to using brown sugar, adding extra lemon and opening the door halfway through baking. Whoops. Preheat your oven to 180 C. Grease and line your loaf tin well. Cream together butter and sugar until very light and fluffy and add eggs, one at a time and lemon zest, beating them in well. At this point I removed the bowl from the mixer and did the rest by hand. Gently fold in the flour, mixing gently, but thoroughly and then add the milk, stirring until all combined and smooth. Don’t overbeat though. Spoon the batter into your prepared tin and bake for 45 mins or until cake tester comes out clean. Psst don’t open the oven door halfway through or your cake will sink. I told a porky and said the syrup poured over a very hot cake straight out of the oven caused it to sink in the middle. And they believed me. For the syrup put the lemon juice and icing sugar into a small saucepan, making sure you squeeze every last drop out of the lemon and include quite a bit of flesh as this adds little bursts of lemony sharpness with each bite. Heat gently until the sugar dissolves and you have a thickened syrup to pour all over your hot cake out of the oven. As soon as the cake is out of oven, puncture all over with skewer and pour over the syrup. 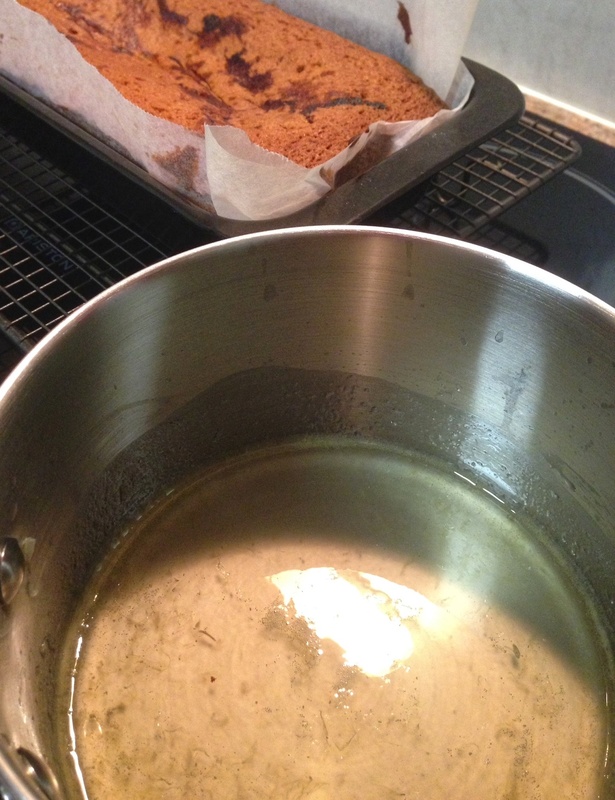 Leave cake to cool completely before removing from the tin. 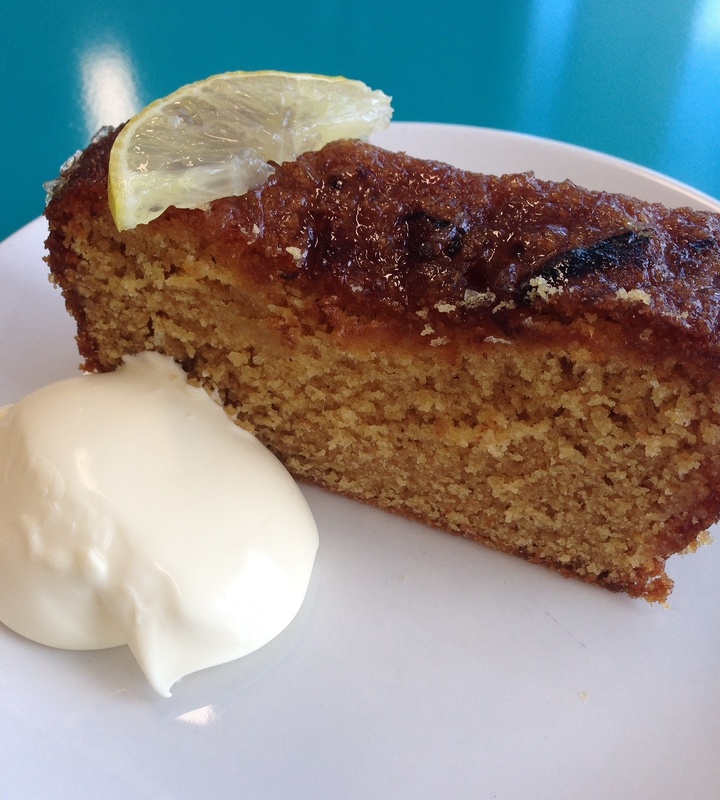 I left my cake wrapped in the baking paper as this sealed in all the syrup so the edges had a thick layer of lemon stickyness that was divine with the double cream I served it with. It wasn’t the majestic thing of wonder that I had promised, but it was all baked and doused in syrup by 11.30 pm and I could toddle off to bed, comforted by the knowledge that a quick stop in the morning to the local shops for some thick double cream, to be dolloped on the side of the moist cake, with a smash hit of lemon tang, was waiting to faretheewell the mother off into motherhood. See ya, Nyssa. Looks great. You can still bring your cooking for all your colleagues in at work !!! The “feeder” needs to ensure her efforts are not wasted. Did I mention I am a foodie?? You can feed me anytime Hahahahaha! 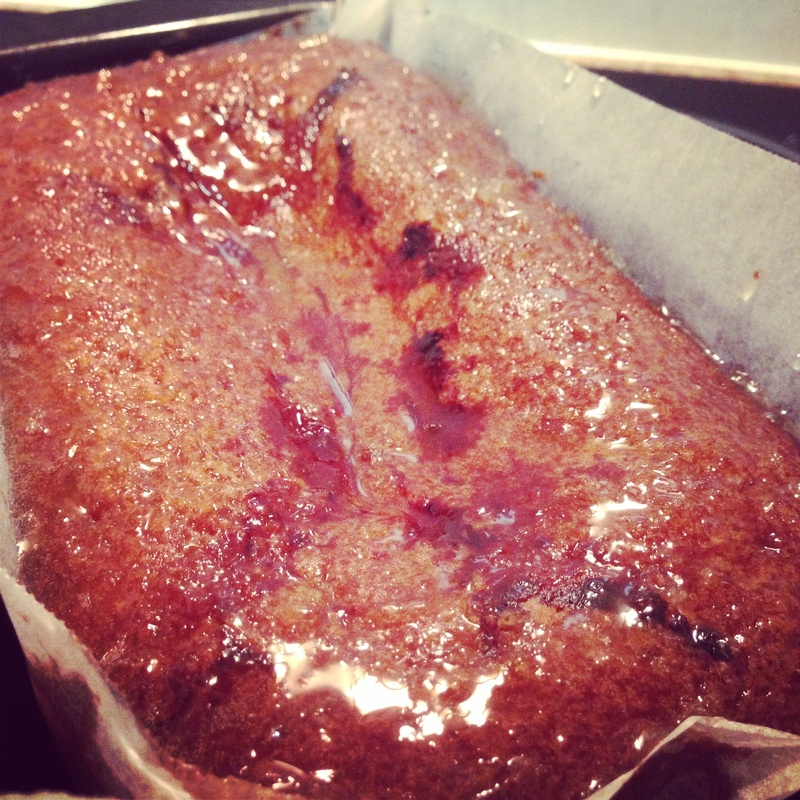 Everything you make looks and sounds amazing whether or not the colour turned dark with brown sugar!